Why did I name her Serenity? I came up with the plot and characters for SERENITY a few years before I was published (like back when I was in college). 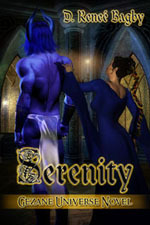 At that time, I had decided I wanted a character named Serenity that would either live up to her name or be trying to live it down. I didn’t know which heroine would get the name or in which book she would appear, I just knew I wanted one of my heroines to have the name. When it came time to match the name to a heroine, SERENITY in its rough draft incarnation just jumped out at me. It made perfect sense for a heroine who is constantly in danger to be serene through it all. My only regret about naming this heroine Serenity and subsequently the book the same thing (since I name the books after the heroines), is that SERENITY the movie by Joss Whedon came out before I got the book published and most people thought I had named the heroine Serenity for that reason.